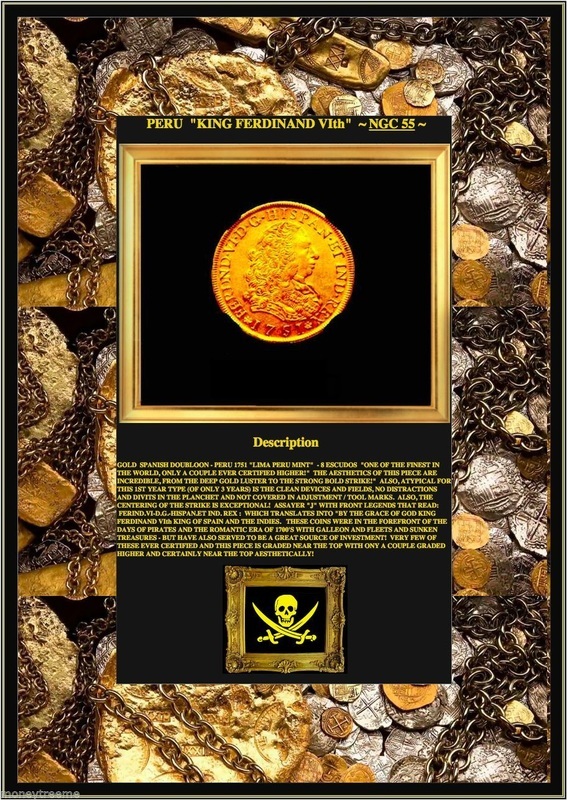 GOLD SPANISH DOUBLOON - PERU 1751 "LIMA PERU MINT" - 8 ESCUDOS "ONE OF THE FINEST IN THE WORLD, ONLY A COUPLE EVER CERTIFIED HIGHER!" 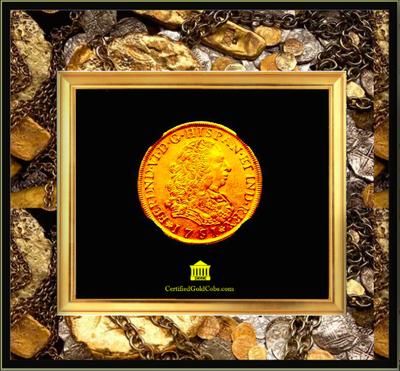 THE AESTHETICS OF THIS PIECE ARE INCREDIBLE, FROM THE DEEP GOLD LUSTER TO THE STRONG BOLD STRIKE!" ALSO, ATYPICAL FOR THIS 1ST YEAR TYPE (OF ONLY 3 YEARS) IS THE CLEAN DEVICES AND FIELDS, NO DISTRACTIONS AND DIVITS IN THE PLANCHET AND NOT COVERED IN ADJUSTMENT / TOOL MARKS. ALSO, THE CENTERING OF THE STRIKE IS EXCEPTIONAL! ASSAYER "J" WITH FRONT LEGENDS THAT READ: FERIND.VI-D.G.-HISPAN.ET IND. 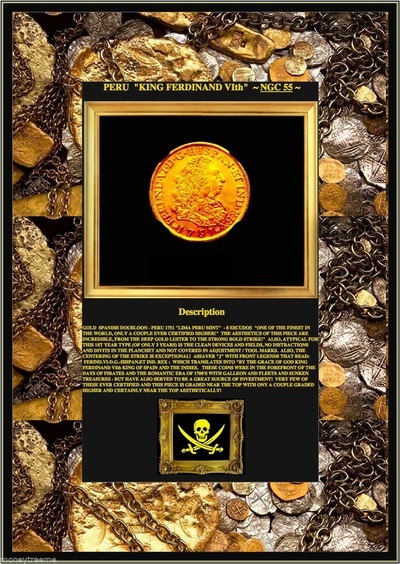 REX : WHICH TRANSLATES INTO "BY THE GRACE OF GOD KING FERDINAND VIth KING OF SPAIN AND THE INDIES. 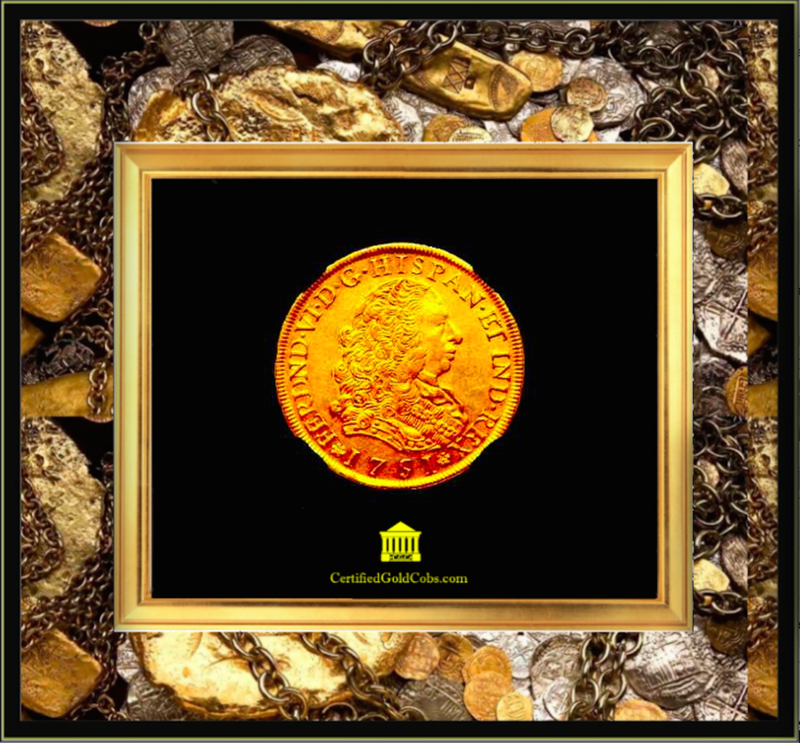 THESE COINS WERE IN THE FOREFRONT OF THE DAYS OF PIRATES AND THE ROMANTIC ERA OF 1700'S WITH GALLEON AND FLEETS AND SUNKEN TREASURES - BUT HAVE ALSO SERVED TO BE A GREAT SOURCE OF INVESTMENT! 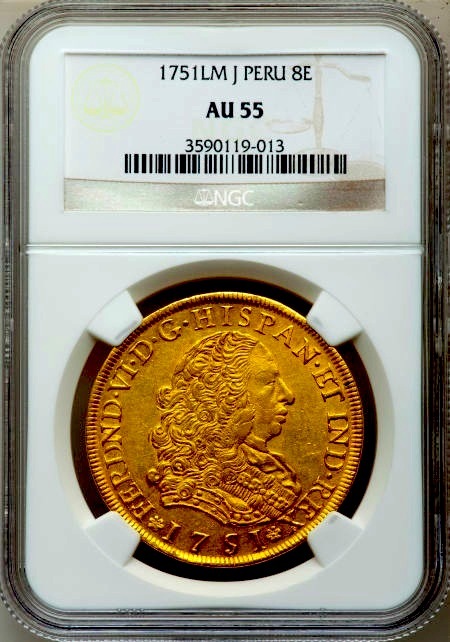 VERY FEW OF THESE EVER CERTIFIED AND THIS PIECE IS GRADED NEAR THE TOP WITH ONY A COUPLE GRADED HIGHER AND CERTAINLY NEAR THE TOP AESTHETICALLY!